This is a fantastic book and I encourage others to buy it. It becomes crystal clear how Islam may have started as a peaceful set of ideals, as many religions might, but, hundreds of years ago, became a mandate for control by crippling authority, brainwashing and murder. Unlike other religions, which may have shared some of these traits to varying degrees, but which have matured over centuries, Islam is still stuck in this ancient ideology and is increasingly being imported into modern life. As the death toll rises almost daily this represents an urgent and growing risk to modern life, yet, seemingly bizarrely, our politicians and many well-educated leaders cannot see it. They describe Islam as a religion of peace and these suicidal individuals as outliers. Why is this? The somewhat cryptic arrangement of the Koran hides its murderous nature and leaves non-followers, and indeed many followers, with the idea that it is a way of peaceful living. 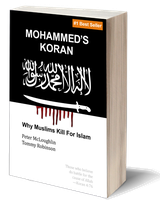 This book deciphers the arrangement and Islam's true nature is exposed so that, for the first time, people with no religious background or desire to spend months unpicking it, can clearly see how Islam works and brainwashes true believers into becoming killers. As Sam Harris said, Islam is around 700 years behind Christianity but it's happening today when we have tools of great destruction available, and so we cannot afford to wait 700 years for Islam to mature. Single brainwashed individuals can wreak havoc and cause dozens of deaths at a time. This book shows how the Koran, far from being a book of peace, is the instruction manual of death and destruction for these individuals. It should be the biggest wake-up call we've ever had. The book also makes a great reference copy of the Koran too and has indices for the encoded and decoded arrangements. Great work.